Ann Lorraine Labriola, the inspired Key West artist of the Stargazer Sculpture, created this amazing scuba diving Key West piece for several reasons. The first reason behind her artificial reef project, was to help funnel traffic away from the more fragile coral reefs. She believed the Key West Florida area was the appropriate location. By placing her artwork here, she'd help reduce some of the heavy traffic Sand Key experiences from those out Key West diving and snorkeling. She also felt that the proximity to Sand Key and Key West FL would benefit her, by increasing awareness of her project. The other reason she decided to create this unique piece of art, was to pay homage to the mariners of old. Before modern technology, ship's Captains navigated the waters using the stars as their guide. Towards that end, she designed and cut the shapes of the various constellations into the different steel pieces, paying tribute to these skilled masters of the sea. Ann Lorraine Labriolas' concept for this statue is in itself both brilliant and beautiful. Her intent was that the structure built to resemble a primitive navigational device, be lit from below. This illumination would make the stars that were cut into it's shape, appear to shine under water. Since being built and placed in 1992, this unusual grouping is a work of art still in progress. Once positioned, the Florida Keys marine life began to quickly attach to the individually designed pieces of the sculpture. Over the years, the statue has become more encrusted. This natural beautification process has increased it's size and added to it's overall shape and character. 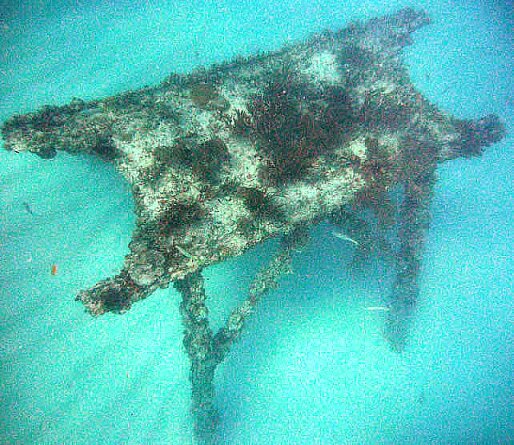 This Key West artificial reef consists of 10 individual steel pieces, each weighing approximately 6 tons and supported by steel legs. These supports keep the pieces elevated above the ocean floor as they stretch over an area of about 200 feet. The various portions of the statue have also been designed with different forms in mind. Some are flat resembling a table, and have the shapes of the constellations cut into their surfaces. Another has the shape of a large circle. This piece has cross beams which adds to it's resemblance of a mandala. This is a very appropriate design choice as these ancient symbols often represent the celestial circles we call earth, sun, and moon, and include the symbolism of friends, family, and community. Another piece which the artist refers to as "The Arrow" has the Little Dipper's constellation cut into it's form. This section of the statue points due west, and is raised 5 feet off the ocean floor by it's steel legs. The unusual shape Ann Lorraine Labriola created is what draws visitors to the area. It appears even more unusual and spectacular from the air. It has been compared to the shape of a bird, and even to an unusual looking navigational device, perhaps used by aliens. Stargazer Sculpture is one of the more unusual Florida Keys dive sites you can explore when scuba diving Key West. When compared to other Florida Keys dive sites, the size of this project is relatively small. This means you won't have to factor in much time when including this as part of your Key West dive schedule. Since that's the case, this makes this underwater art project the perfect stopping off point for kick starting your day. Or it could be a splendid and unusually interesting last Key West dive. What a wonderful way to end an already spectacular day, on your next scuba diving Key West vacation.